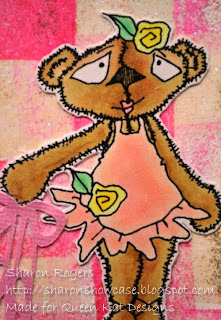 Queen Kat Designs: Tutu cute!!!! 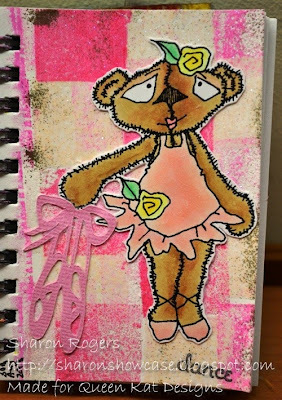 Today I am sharing a mini journal page using this gorgeous "Bearly a Ballerina" image from Sandra Caldwell - available at the QKD Store - she is so sweet! As Copic Markers are my favourite colouring medium this cute little ballerina has been coloured with my markers - in pink of course - LOL! Back ground was made using my little square ink pads in shades of pink direct to the page to make a chequered look. My little ink pads are soooo old that some of them just disintegrated when I used them but what a great way to use them up and then throw away - I guess it's also an excuse to buy some more!! The ink didn't want to dry so I decided to cover the page with embossing powder and emboss - has a great shiny & shimmery effect. 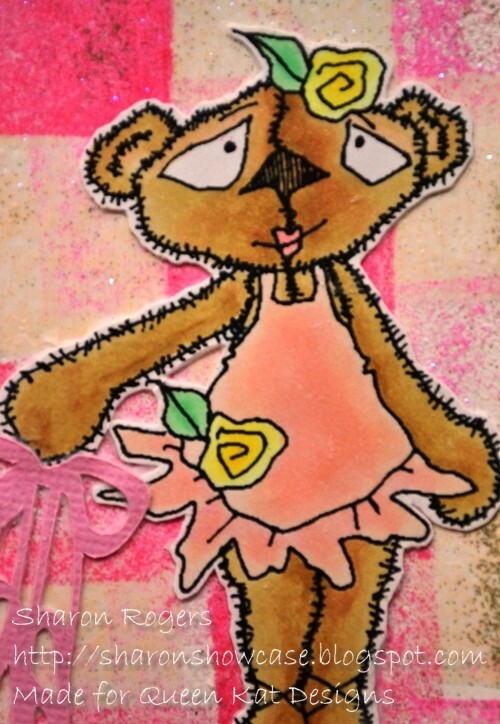 Then I glued the ballerina over the background added a ballet shoes die cut and stamped "dance" in the corner. I love to create in my mini journal - a nice little size page (about the same size as an ATC) to play with! Sharon, I love your background. Such a wonderful stamp. Love that stamp, and the mini journal is a great gift idea!